Get out into the great outdoors of Wales’ castles, mountains and beaches! Practitioners from all art forms are welcome, including street theatre, carnival, procession, puppetry, circus and arts installation. 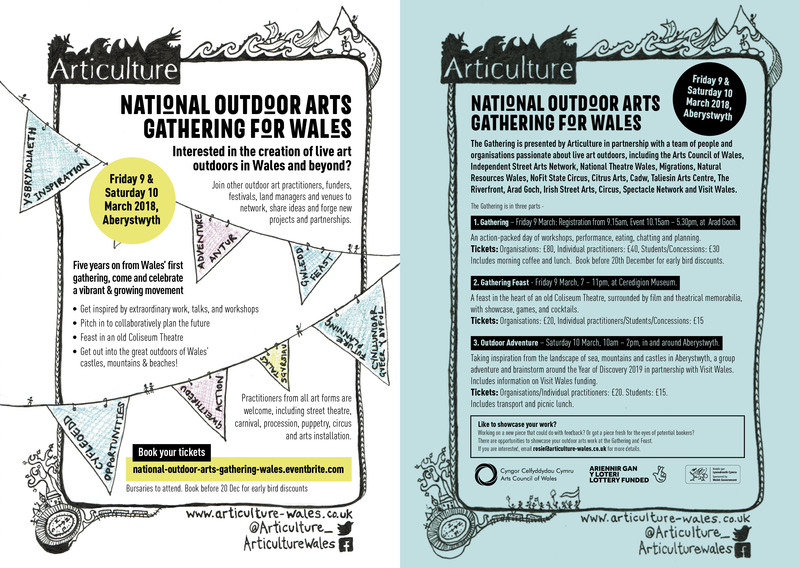 The Gathering is presented by Articulture in partnership with a team of people and organisations passionate about live art outdoors, including the Arts Council of Wales, Independent Street Arts Network, National Theatre Wales, Migrations, Natural Resources Wales, NoFit State Circus, Citrus Arts, Cadw, Taliesin Arts Centre, The Riverfront, Arad Goch, Irish Street Arts, Circus and Spectacle Network and Visit Wales.